Not to be confused with Steve Smith Sr..
Steven Smith (born May 6, 1985) is a former American football wide receiver in the National Football League (NFL). He played college football for the University of Southern California (USC), and earned All-American honors. He was drafted by the New York Giants in the second round of the 2007 NFL Draft, and has also played for the Philadelphia Eagles, St. Louis Rams, and Tampa Bay Buccaneers. Smith was born in Anchorage, Alaska. He played at Taft High School in the San Fernando Valley, where he set the state records for most receptions (271) and yardage (4486) in a varsity career, and led the Toreadors to two consecutive Los Angeles City Section Championship games (although they lost both games). His career yardage record was surpassed by Canyon High School Wide Receiver, Drew Wolitarsky on October 5, 2012. He played in the 2003 U.S. Army All-American Bowl with several of his USC Trojan teammates including Reggie Bush, LenDale White, and Sam Baker. He also played high school basketball and was a teammate with former Los Angeles Lakers point guard Jordan Farmar. 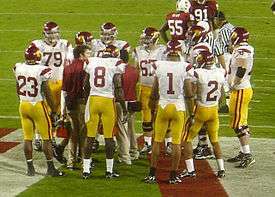 Smith (#2) in the huddle during a 2006 game. Smith attended the University of Southern California, where he was one of the top two wide receivers by yardage for the USC Trojans football team. He was on the Maxwell Award 2006 watch list for the best player in college football and was named to the 2006 All Pac-10 team First Team and to the 2006 All Pac-10 Second Team by rivals.com. Smith was named honorable mention on the SI.com All-American team and First-team All-American by CBS Sportsline. Smith was voted team MVP in 2006 by teammates of his 4th ranked Trojans team. Smith caught three touchdown passes from Heisman Trophy winner Matt Leinart in USC's 55-19 national championship/Orange Bowl victory over Oklahoma. Smith was drafted in the second round (51st overall) by the New York Giants in the 2007 NFL Draft. He wore number 12. Smith only played in 5 games in the 2007 regular season (Weeks 1, 2, 15, 16, 17), recording 8 catches for 63 yards and no touchdowns. However, after returning from a shoulder and hamstring injury, Smith turned in an outstanding postseason as he became a reliable third down receiver for quarterback Manning. He made two big catches at the end of the first half in Dallas, which set up a game-tying touchdown and caught five passes in Super Bowl XLII, including four on third down. One of which was a 12-yard reception on a third and 11 with 45 seconds remaining in the fourth quarter. Smith and the Giants prevailed over the New England Patriots 17-14. In the 2008 regular season, Smith became one of Manning's favorite targets, and not just on 3rd down as Smith led the Giants in receptions over Amani Toomer and Plaxico Burress, who both started over Smith. Smith helped the Giants win the NFC East division. In the 2009 season, with the Giants' loss of Burress and Toomer, Smith and Domenik Hixon were named the starting wideouts. Smith opened the season explosively, and by the end of week 4, Smith led the NFL in receptions (34), receiving yards (411), and touchdown receptions (4). In Week 15, in a game against the Redskins, Smith broke the Giants franchise record for most receptions in a single season, also becoming the first Giants receiver in history to make 90 catches in one season. Smith was selected as an alternate in the 2010 Pro Bowl. He later replaced Arizona Cardinals wide receiver Larry Fitzgerald on the 2010 Pro Bowl roster after Fitzgerald withdrew with an injury. On August 10, 2011, Smith agreed to a one-year, $2 million deal with the Philadelphia Eagles. He was placed on the active/physically unable to perform list on August 13. He was activated from the list on August 27. He had eleven catches for 124 yards and a touchdown before he was placed on injured reserve on December 12 due to a bone bruise in his knee. He played in nine games for the Eagles, with one start against the Arizona Cardinals on November 13, in which he made five catches for 47 yards. The St. Louis Rams signed Smith on March 26, 2012. On April 2, 2013, Smith signed with the Tampa Bay Buccaneers. Smith announced his retirement on May 29, 2013. Smith's brother, Malcolm Smith, linebacker for the Oakland Raiders, was the MVP of Super Bowl XLVIII with the Seattle Seahawks. According to his bio page from the New York Giants, Steve was a Public Policy/Management and Planning major at USC. He was born in Anchorage, Alaska, raised in Woodland Hills, California and Canoga Park, California, but currently resides in Woodland Hills, CA. Smith was robbed at gunpoint on November 25, 2008 after arriving home, according to Clifton, New Jersey police. Smith had just returned to his house when he was approached from behind by a man who put a gun to Smith's head, Clifton police Captain Robert Rowan said. "He said to him, 'Give me everything you got,' and Mr. Smith turned over his jewelry, money and cell phone," Rowan said. Smith suffered no injuries. ↑ "Steve Smith #12 WR". NFL Enterprises LLC. Retrieved November 26, 2012. ↑ The awards are voted on by Pac-10 coaches. 2006 All Pac-10 team, scout.com, November 27, 2006. ↑ "NFL Draft Scout". NFL Draft Scout. Retrieved November 26, 2012. ↑ "Eagles WR Smith ends up on injured reserve with knee injury". NFL.com. December 12, 2011. Retrieved 2011-12-13. ↑ Rosenthal, Gregg (April 2, 2013). "Steve Smith, Nate Kaeding join Tampa Bay Buccaneers". National Football League. Retrieved April 2, 2013. Wikimedia Commons has media related to Steve Smith (wide receiver, born 1985).